The animation might not stand up to today's standards, but the 1967 Spider-Man cartoon is still beloved and cherished by many. 2013 Rittenhouse Spider-Man Original Animated Series Lenticular trading cards captures the spirit of the show with a 10-card factory set. Sets come with nine lenticular motion cards. Each has a small chunk of motion that showcases the colorful look of the cartoon. 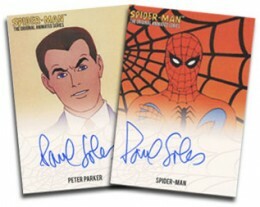 Every 2013 Rittenhouse Spider-Man Original Animated Series Lenticular set also comes with a Paul Soles autograph card. Soles voiced Spider-Man and his alter ego, Peter Parker, in the show. He also provided the voice for Hermey, the elf who didn't like to make toys, on Rudolph the Red-Nosed Reindeer. There are two different Soles autographs. One pictures Peter Parker. The other has Spider-Man. 2013 Rittenhouse Spider-Man Original Animated Series Lenticular is limited to 500 sets. Those who order two sets are guaranteed to get one of each of the Paul Soles autograph cards.